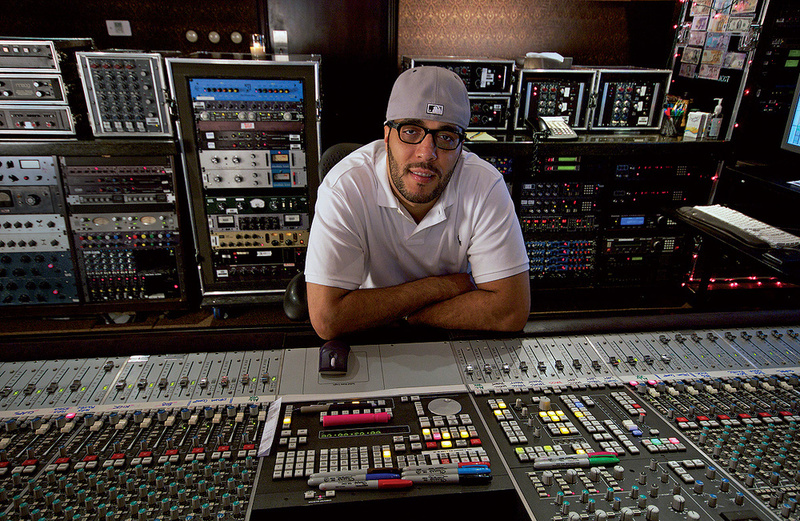 In his second career in the music business, Jaycen Joshua has become one of the USA's top mix engineers. With child star Justin Bieber, the brief was to bring urban grit to pop production. Jaycen Joshua is talking from Studio 1 of Larrabee Studios in Los Angeles, a place that has been his home for the last seven and a half years. Larrabee houses three of the word's top mixers, the other two being David Pensado (see SOS January 2007) and Manny Marroquin (see SOS December 2007), and Joshua estimates that between them, the trio cover about 50 percent of charting American pop mixes. Unlike the others, however, Joshua's list of published credits is relatively short, and it turns out that this reflects his close connection with Pensado. Joshua worked as the legendary mixer's assistant between 2006 and 2008, and during the latter part of his tenure, the two worked together on equal footing. In this capacity the duo shared a Grammy for Mary J Blige's Growing Pains (2008), but in many places only Pensado's name is mentioned, the assumption presumably being that Joshua was just his assistant. This is despite a music industry pedigree that goes back, astonishingly, to his early teens, with his main introduction having been provided by Jheryl Busby, the Motown mogul who died in 2008. Early this year, Jaycen Joshua also earned Grammy nominations as part of the production team of Jamie Foxx's Intuition and Beyoncé's I Am... Sasha Fierce, mixing the most ear‑catching single from the album, the three‑time Grammy-winning megahit 'Single Ladies (Put A Ring On It)'. 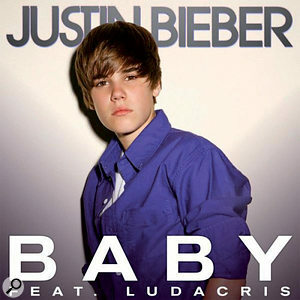 Another high‑profile hit mixed by Joshua is Justin Bieber's 'Baby'. Joshua and Pensado mixed the majority of the Canadian teenager's debut EP My World (2009), and Joshua shared mixing credits on this year's follow‑up My World 2.0 with Manny Marroquin and Serban Ghenea. 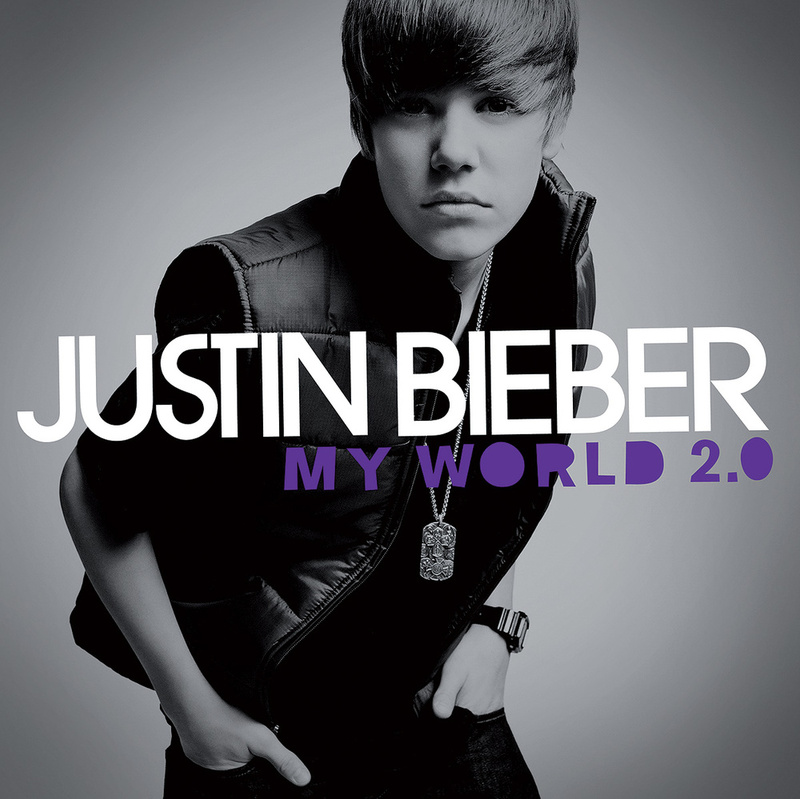 My World 2.0 is Bieber's first full‑length album, and even more than his debut EP, represents a deliberate attempt to get the white teenage sensation to bridge the gap between clean bubblegum and gritty urban music. To this end, urban producers like The‑Dream, Tricky Stewart, The Messengers and Bryan‑Michael Cox were contracted, with everything coming together in the lead single 'Baby', written and produced by The‑Dream and Stewart, and also featuring rapper Ludacris. Both single and album ended up being massive international hits. Unlike many other successful mix engineers, Jaycen Joshua puts great emphasis on hearing the rough mix. "You really have to engulf yourself into these rough mixes nowadays, because these kids spend so much time and so much creative energy on these roughs that if you don't really understand the track and their ideas, you are going to get killed. Many older engineers will knock these kids, saying that they're only using plug‑ins, and that the older stuff sounds so much better, and everything is getting worse and worse and worse. And I am saying: your idea of worse is not everybody's idea of worse. Pro Tools, or other DAWs, and plug‑ins might not sound like outboard gear, but they are giving kids who may have better creative ideas than you and me the opportunity to do the same thing as we are doing. What they may be losing in sonic quality they gain in creative possibilities. In terms of the war that is going on between engineers nowadays and all these young engineers coming up on Pro Tools, nobody can tell me that engineers know more about hip‑hop than an 18‑year‑old African‑American kid who grew up listening to it. That is impossible. We are stuck in our studios every day, so how are we going to know? "Sixty to 70 percent of the mixes I get in are done by the producer and engineers in their own studio setups. They most likely will have spent two to three weeks getting their rough mix to sound incredible for the label, and they will have lived with these mixes and the delays and the drops and the other effects and gotten used to them. Once your ear gets accustomed to things, it's what you tend to like. So I need to hear their rough mix before I do anything, otherwise I'll be chasing that rough mix for the rest of the process. 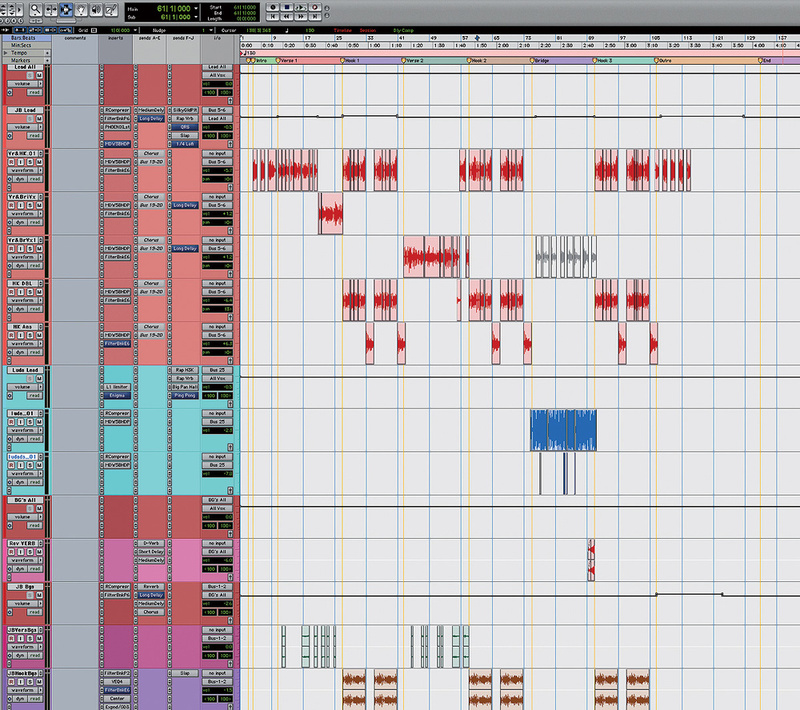 Nonetheless, in 50 percent of cases, people won't send me the rough mix. So in the standard email that we send out to our clients I say that I don't work on records for which I don't have all the files, including the rough mix, at least three days in advance. I also ask them to send me everything on time, and leave every plug‑in, every effect, every automation move. If they used outboard, I ask them to print the track with and without the effect. Ninety percent of the time I may not use what's there, but it works much better for me to hear their ideas, and be inspired by them and respond to them, so I can either expand on them or suggest trying something different. 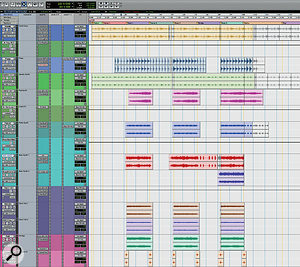 Jaycen Joshua attaches a lot of importance to organisation in his Pro Tools Sessions, and has them meticulously prepared by his assistants: note the colour‑coding and the comment field listing the contents of each track. This screen shows a small section of the 'Baby' Session, with the prominent 'Synth Keys 1' track at top. "Receiving the files three days in advance gives my assistants the chance to prepare the Session, organising everything in the way I like, colour‑coding and labelling all tracks and plug‑ins and so on, so all I have to do is come in and push up the faders. As you can see from the 'Baby' screenshots, I'll have drums and percussion in yellow, the high end in orange, the bass in red, lead vocals in red, my whole slew of effect tracks in dark green and the original effects of the client in light green, and so on. I also ask my assistants to put the contents of the tracks in the Comments window: we don't change the original track names in case we need to re‑import the Session and match it up. For someone who is mixing every single day of their lives, and particularly because people with home studios organise their tracks in any number of ways, organisation is a number one priority. In general I only have a day to do a mix, which is why my assistants do all the tedious organising, which can take two hours or more. For me those are two hours of potential creativity that I can never get back! 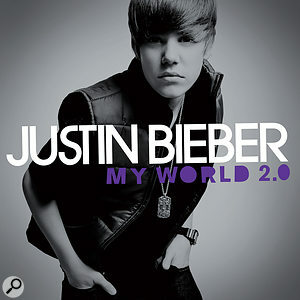 Written by Justin Bieber, The‑Dream, Tricky Stewart, Christina Milian, Ludacris. Produced by The‑Dream, Stewart, Milian. Jaycen Joshua: "When I begin a mix, I'll basically start with attacking what I think is the most important part of the record. If I think the rhythm section is driving it, then I will start with that. If I think it is the vocal, or a main melody played on strings or piano, I'll begin with that. In the case of 'Baby', it was all about the beat and the vocals, and I began with the drums, which I wanted to sound very aggressive, with lots of punch. I also tried to open the track up a little by taking things out, mostly in the lead‑up to the hooks. All the greyed‑out bits were done by me. Another aspect of the way I organise my mix is that I split the whole track up in three groups: rhythm section, music (mostly keyboards and synths), and the vocals. So after having gone through the SSL, the rhythm section, the melody tracks, and the vocals, each are sent to sub busses on the SSL, which are then each returned to two faders. So I have a six‑channel submix before finally summing to stereo. The main instrumental element of the song was a track originally named 'Piano', but labelled 'Synth Keys 1' in Joshua's comments field. This was quite heavily processed using Cranesong's Phoenix Dark Essence, the Aphex Aural Exciter plug‑in, McDSP's Filterbank EQ and Digidesign's stock delay plug‑in. Drums & Bass: Neve preamps & EQ, Studer A827, Dbx 160, Pultec EQP1A, API 550A, McDSP Filterbank, Digidesign Trim Adjuster, Medium Delay, Empirical Labs Fatso, Moog EQ. "There are eight percussion tracks. The 808 is really a hi‑hat, then there are two kicks, clap (with clap reverb), clap 2, hi‑hat, crash and drum roll. Everything was programmed on this track. Apart from the hi‑hat and the crash, which went through the SSL, I put everything through the Neve 1073 mic pres because I wanted punch on these tracks, but not SSL punch. Also, this specific record was a bit weird, because I asked my assistants to dump all drums tracks to two‑inch tape, on a Studer A827, using Quantegy 499 tape (I have a certain amount of rolls left; it's very difficult to get good tape these days). Dumping stuff to two‑inch doesn't always work, but when it does it rounds out the sound beautifully. The analogue tape gives it a colour that I can't get any other way. Colour is very important. Sometimes I run a track through a piece of gear, like a Fairchild, without touching the compressor, just to get it to add some colour to the sound. "With regard to the specific tracks, the 808 already sounded incredible and had a roundness that I loved, so I didn't do much to it, just some EQ on the board, and it needed a little contouring, for which I used the 1084. The one drawback of the 1073 is that the EQ does not give me enough parameters, so I will put the 1084 on anything that I want to do some detailed Neve EQ'ing on, and use the 1073 for tracks for which I'm only going to use a pre. The two kick tracks went through a signal chain that was made famous by Bob Powers and that was passed on to me by Dave [Pensado], which is a Dbx 160x compressor going into a Pultec EQP1A EQ. This runs on a parallel channel and I add it in with the original signal. It gives you absolutely amazing low end. It's unstoppable. If you listen to Powers' work with Common or A Tribe Called Quest, he's a pioneer and the father of hip‑hop low end. The snare has the 160x going into an API 550A, again parallel. 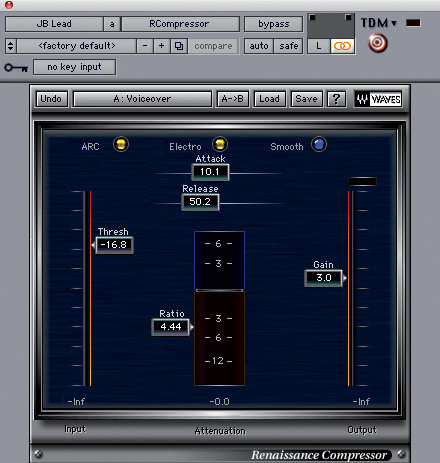 If you don't use parallel compression you risk things sounding thin. You begin with the original track that the producer loves, and if you manipulate that you may deviate too much from it, whereas if you blend a treatment in, it will be more pleasing to the ear. 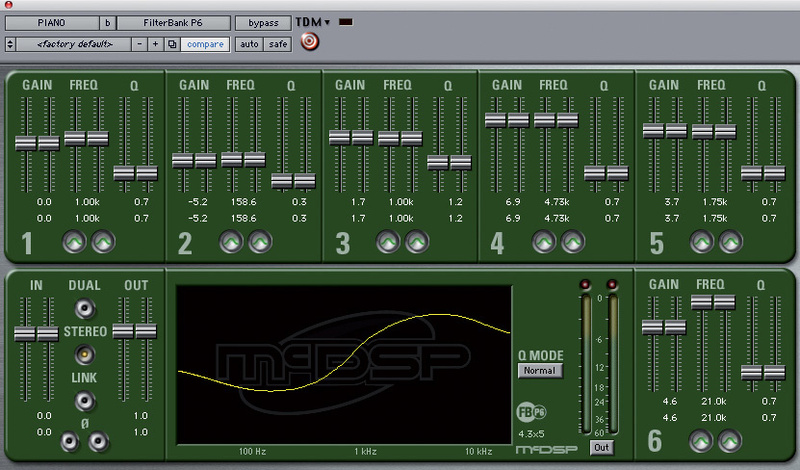 "I also used a number of plug‑ins on the drums, mostly the McDSP Filterbank EQ and the Digidesign Trim Adjuster. 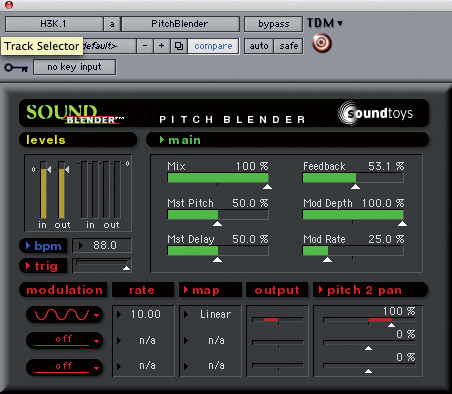 If there's one plug‑in I couldn't live without, it's the Filterbank, and here I used the P2 two‑band parametric EQ. With regard to the Trim Adjuster, if one side of a stereo track doesn't have the same level as the other, instead of pulling the pan to one side I'll use the Trim Adjuster to increase the gain on one side and to make sure I'm dealing with a perfectly balanced stereo track. There's also a Medium Delay on the Crash, because it was originally a mono track, and I wanted it in stereo. So I set the delay to 21ms and mixed the original 100 percent to the left and the delay to the right. Why 21ms? It's a Digi preset on the Medium Delay, 21.19ms to be exact, and when I heard it, it sounded right. With 21ms you get enough separation between left and right and it's a bit dramatic and not so phasey. I didn't try to set the delay in rhythm. You usually already receive a perfectly timed Session, and to get a little feel it's good to have some things that are not exactly in time. The sound becomes like a drummer hitting two cymbals, left and right, at the same time. Keyboards & Guitars: Cranesong Phoenix, Aphex Aural Exciter, McDSP Filterbank, Digidesign Extra Long Delay & Tel‑Ray, 'Motown' EQ, BASE Spatializer, Waves GTR. "The main instrumental track is the piano track that we retitled 'Synth Keys'. It sounded a little thin to my ears, so I used quite a few plug‑ins on that.The Cranesong Phoenix Dark Essence is a great plug‑in, it emulates tape saturation and it makes the sound a bit darker. The Aural Exciter adds a little top end. A lot of people don't like the fact that it adds distortion to your sound, but that high distortion gave exactly what I was looking for. The Filterbank beefed up the low end, and there's also a Digi Extra Long Delay. 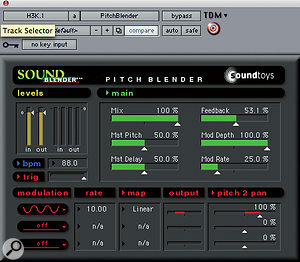 'Js Keys Delay' is an effects track with the Digi Tel‑Ray delay that was blended in with the piano below. The Tel‑Ray is a great‑sounding delay that I love on piano. In general I don't like using reverb too much because it can cloud up your tracks and make them less clean. So it's fun to use delays instead and the Tel‑Ray is very distinct, it kind of mimics the sound of the hammers hitting the piano strings. This part of the Session includes most of Justin Bieber's (red) and Ludacris's vocal tracks. 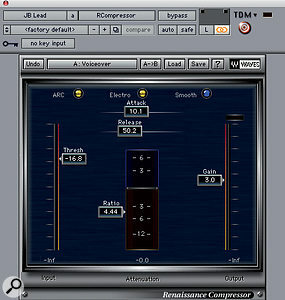 The lead vocal was split to several tracks with different EQ settings for different parts of the song. "A lot of people are down on the Digidesign plug‑ins because they don't look special, but I reckon that Digi are the ones who invented the game we're playing right now, so why would their plug‑ins not be good? I also like the DVerb, for instance, which was used by the client to make things more roomy and bigger, and I left it. With regards to outboard, I had the Motown EQ on the main 'Synth Keys' part, but no compression, because I wanted to retain an open feel and for the track to have dynamics, and I had enough compression in the rhythm section. 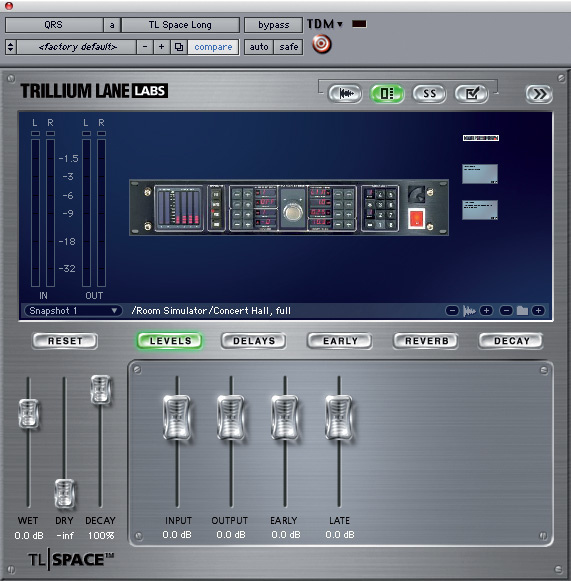 I also had the old BASE Spatializer on the main pad in the hooks. I'm big on space, but we only have two speakers to work with, and it's a challenge to fit everything. I love the way someone like Dr Dre, for example, doesn't fill up his records with too many instruments. On this record, the Buzz Synth had a lot of low‑mid and sounded very full, so to separate that from the pad synth I put the pad synth outside of the speakers with the Spatializer. 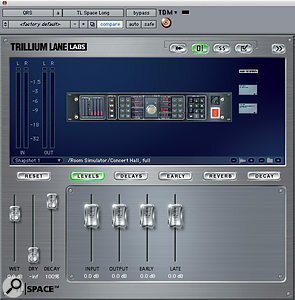 The TL Space convolution reverb was widely used, in this case to emulate a Quantec Room Simulator patch as one of the vocal reverbs. Vocals: Celemony Melodyne, Digidesign TL Space & Extra Long Delay, Massenburg EQ, Cranesong Phoenix, Waves Center, Renaissance Compressor & Metaflanger, Sound Toys Pitchblender. "Justin is in red, Ludacris in light blue. The main vocal is at the top, 'Lead All'. In fact, all the tracks in red are Justin's lead, but I vary the effects compression and EQ on his vocals during the song, so I split the main vocal track up and every one of the tracks below is dedicated to a different EQ for a different section of the song. When he changes his tone, the EQ has to change. "The vocals were tuned by us. Tuning is one aspect of the game that you have to have. Consumers' and clients' ears have become accustomed to hearing vocals perfectly in tune, to the degree that if you now hear a record on which a person sings natural and is not tuned, you feel that something isn't right. 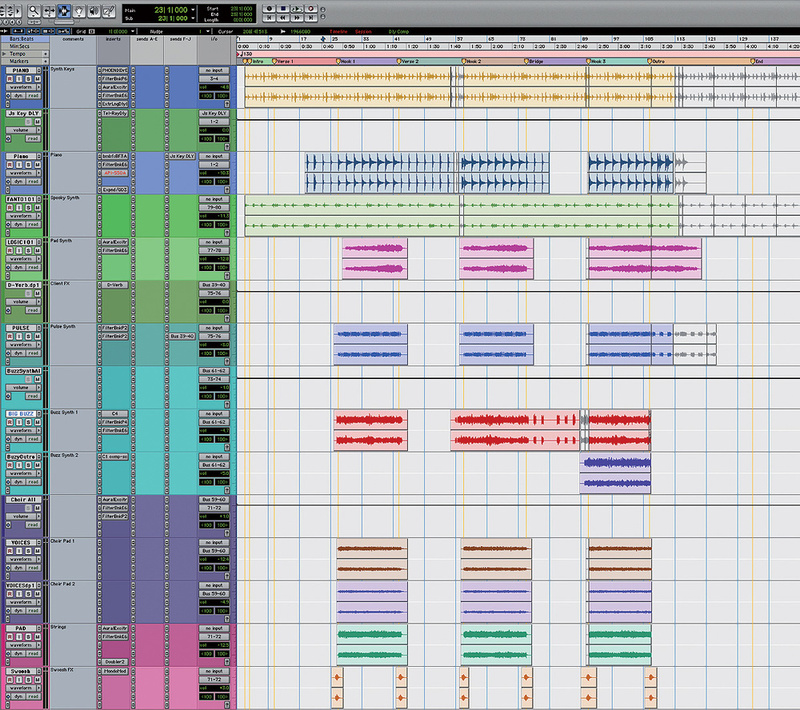 I prefer to use Melodyne. I am not a huge fan of Auto‑Tune, unless it is the sound that you are looking for. For me it's an effect, not really a tuner. If you want to tune your vocals and for them to sound natural, you can do stuff with Melodyne that seems almost impossible. I also retain the original vocal in the Playlist, so if I want to retune or go back to its natural note, I can dial that up. Cranesong's Phoenix was used again to thicken Justin Bieber's lead vocal, which was also compressed using Waves' Renaissance Compressor. "I did the vocal effects 100 percent in the box on this record, and they're all sends to effects tracks that are marked in the darker green. (I didn't use the original vocal effects in the lighter green.) There are so many effects because, like with the EQ, I'll treat his vocals differently for different sections of the song. I'm using two convolution reverbs, one being the Digidesign TL Space, especially the 'Silky Gold Plate', 'QRS', and 'Big Pan Hall' reverb settings. 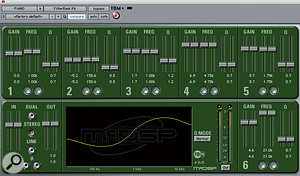 The last is a phasey panning reverb.Other plug‑ins are the Massenburg EQ, which is very precise, with very tight Q, so you can notch out very small bandwidth frequencies. It has something that every EQ should have, which is that you can solo and sweep the frequency you are affecting, so you can find the frequency that you hate and notch it out. "I also used the Cranesong Phoenix again, which is so important in rock music. 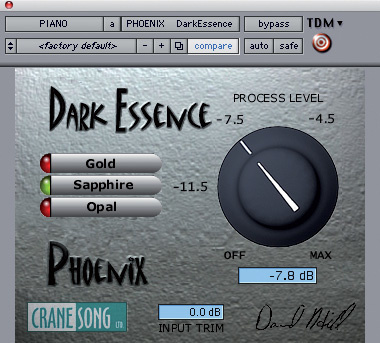 I know a huge producer who uses the Phoenix Dark Essence with the 'Gold' preset on every track before he even starts. On this track, because Justin is so young and is a little harsh in his mid‑range, I went for the Luster to add fullness and some warmth. Finally, on Justin's backing vocals, 'JBVrsBg1', which are the 'yeah‑yeahs' at the end, I put the Waves Center plug‑in, which is great because it lets you place exactly where you want your low or your high or your punch in the stereo spectrum. There's a great preset called 'Less Vocal' that takes the vocal away from the centre and expands it, so it's not so in your face. This gives your lead more space in the middle. Often it's good to play with the spatial aspects of your backing vocals. Submixes: SSL G384, GML 8200, Avalon 2055. An 80‑channel SSL XL 9000K desk with a custom suede trim dominates Jaycen Joshua's room at Larrabee. When queried, Joshua proudly declares himself to be beyond the analogue versus digital and in‑the‑box versus out‑of‑the‑box debates. "I am new school: whatever works, works. I owe 99 percent of my know‑how to Dave [Pensado] and he's a big fan of the SSL, and during my A&R career every mix that I witnessed was done on an SSL. So I'm conditioned to like the SSL sound and to working with it. At the same time, people like Serban [Ghenea] and Phil Tan [see SOS February 2007 issue] are doing incredible mixes in the box. A lot of people have opinions about in the box versus out of the box, but both have their advantages. There are things that you can do in the box that you can't do outside. So with regards to the out of the box and in the box arguments, I am a proponent of both. When I go into battle, I want all my guns ready to go. I want the best of outboard and the best of in the box.